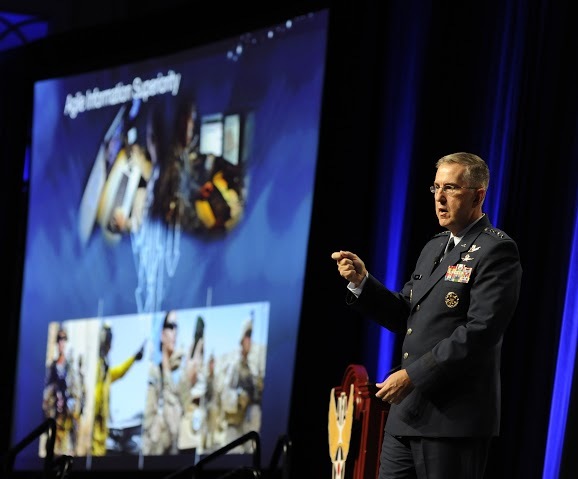 September 19, 2015 – Gen. John Hyten, the Air Force Space Command commander, explained how space and cyberspace domains are integral components in modern and future operations during a speech at the 2015 Air Force Association Air and Space Conference and Technology Exposition September 15. Hyten talked about maintaining information superiority and safeguarding against possible threats to that information. Those communications aren’t limited to land-based communications, he said. The Air Force also needs to be equally as focused on safeguarding satellite communications. The Air Force is working on a developmental planning effort, looking at air superiority in 2030 as a full multi-domain solution. From consolidating the various networks around the Air Force into one, to standing up a test Joint Interagency Combined Space Operations Center, the Airmen in AFSPC are working toward full integration of space and cyber into every Air Force operation.